The Deepwater Horizon oil spill could have been avoided, a soon-to-be-released commission report says. (CNN) -- "Systemic" problems caused the Deepwater Horizon blowout and subsequent oil spill and only "significant reform" will prevent another, President Barack Obama's commission studying the disaster says in its soon-to-be-released report. The National Commission on the BP Deepwater Horizon Oil Spill and Offshore Drilling on Wednesday released a chapter of the report that it says contains the key findings. The report is to be released in full on Tuesday. "The Macondo blowout was the product of several individual missteps and oversights by BP, Halliburton, and Transocean, which government regulators lacked the authority, the necessary resources, and the technical expertise to prevent," the report says. An April 20 explosion on the Deepwater Horizon rig in the Gulf of Mexico killed 11 men and injured 17 working on the rig, launching the worst oil spill in U.S. history. The Macondo well spewed crude into the gulf for three months before the wellhead was successfully capped. -- A flawed design for the cement slurry used to seal the bottom of the well. -- A "negative pressure test" that was incorrectly judged a success. -- Flawed procedures for securing the well. -- Inattention to signals of an impending blowout. -- An ineffective response to the blowout itself. 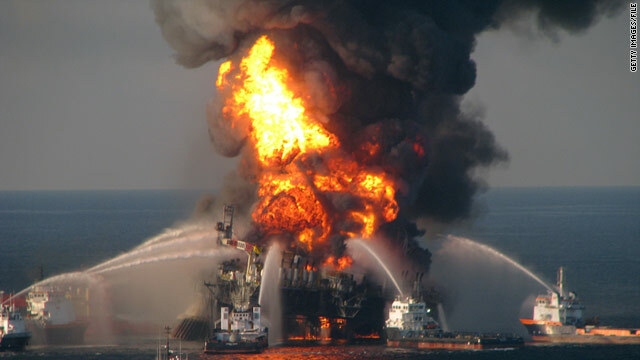 2010: Did oil spill damage BP? BP spokesman Robert Sholars said the oil giant "has cooperated fully with the commission's investigation," stressing "that the accident was the result of multiple causes, involving multiple companies." "BP is working with regulators and the industry to ensure that the lessons learned from Macondo lead to improvements in operations and contractor services in deepwater drilling," Sholars said. The U.S. Department of the Interior said it, too, was already implementing reforms. "The agency has taken unprecedented steps and will continue to make the changes necessary to restore the American people's confidence in the safety and environmental soundness of oil and gas drilling and production on the Outer Continental Shelf, while balancing our nation's important energy needs," spokeswoman Kendra Barkoff said. Barkoff referred reporters to an Interior Department Web page detailing changes in regulations and procedures already made or in process. The commission's report also concluded that the catastrophe could have been avoided. "The commission's findings only compound our sense of tragedy because we know now that the blowout of the Macondo well was avoidable," said commission co-chairman Bob Graham. "This disaster likely would not have happened had the companies involved been guided by an unrelenting commitment to safety first. And it likely would not have happened if the responsible governmental regulators had the capacity and will to demand world class safety standards." Better management would have prevented the incident, but the management problems are not confined to a one company, Graham's co-chairman, William K. Reilly, said. "A key question posed from the outset by this tragedy is: Do we have a single company, BP, that blundered with fatal consequences, or a more pervasive problem of a complacent industry?" asked Reilly. "Given the documented failings of both Transocean and Halliburton, both of which serve the off-shore industry in virtually every ocean, I reluctantly conclude we have a system-wide problem."